Ask me sadly "Please don't go away now"
I remember hearing a tape of Joni Mitchell singing this song numerous times in the late '60s and early '70s. The recording was played on Gene Shay's Folklore show out of Philadelphia, a long-running radio program that I believe Shay is still hosting. He would have guests in his studio every Sunday night till about 2 in the morning, and sometimes replay tapes of the songs they sang on his show. Often, the musicians would come over after a weekend stand at The Main Point, a well-run and popular folk club in Bryn Mawr, Pa., a Philly suburb. I was in my first year of high school, as I remember, and I would stay up late to listen to Bonnie Raitt, Jackson Browne and others. Then I would sleepwalk through school on Monday. 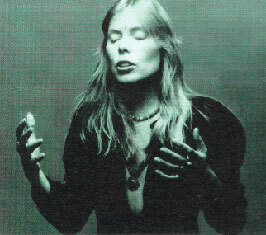 "Eastern Rain" was fabulous as played by Joni (and Fairport Convention did a very nice job too). I guess that begs the question: Are tapes of her many early unrecorded songs on bootlegs? (I'm sure they must be.) And if there are others of the same quality as "Eastern Rain," why doesn't someone oversee an official CD or MP3 release?